Also serving communities of Fort White. To help you with your search, browse the 12 reviews below for assisted living facilities in Lake City. On average, consumers rate assisted living in Lake City 3.7 out of 5 stars. Better rated regions include Live Oak with an average rating of 4.0 out of 5 stars. Located in north-central Florida, Lake City's population is 12,163, 20 percent of whom are seniors. As a result, the city is home to four assisted living facilities, with another one nearby. 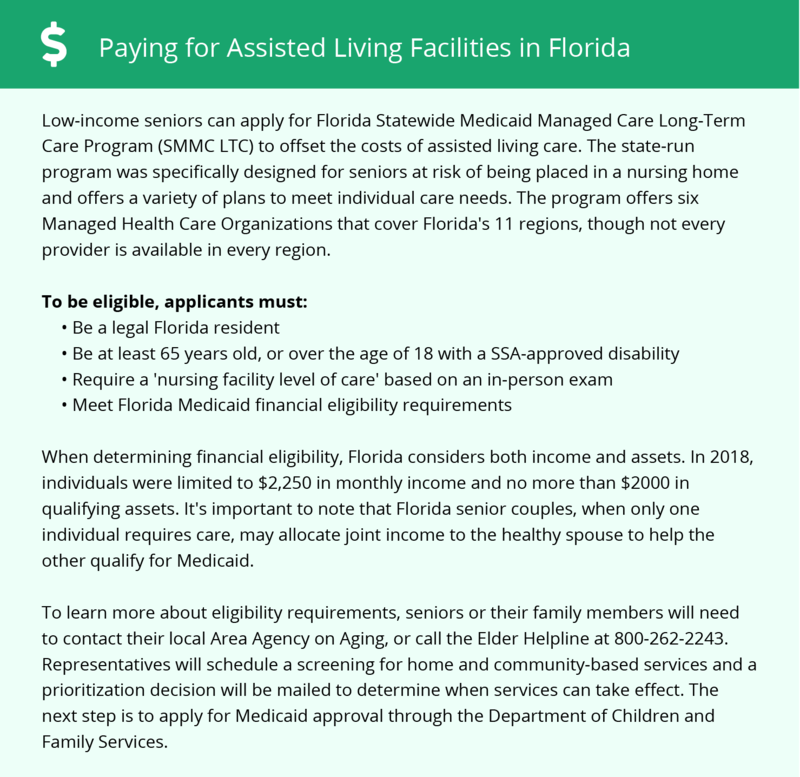 The Florida Department of Elder Affairs defines an assisted living facility, or ALF, as a residential care facility that provides housing, meals and personal care services to its residents. ALFs operating in Florida must obtain a standard license. They can also acquire up to three specialty licenses, including extended congregate care, limited nursing services and limited mental health, which allow them to extend their services. Lake City's location in north-central Florida results in hot, muggy summer months, which are also the rainiest months of the year. Average high temperatures reach 90 degrees in June, July and August. Winter months in Lake City are pleasant, with high temperatures in the mid- and upper 60s, which can be appealing to seniors looking to escape cold and snowy winters. Lake City boasts a low cost of living that's about 14 percent less than the national average. Housing costs, in particular, are an impressive 42 percent lower than average, making the area an affordable option for seniors. Crime rates are high in Lake City, which may be a concern for seniors. There's a 1 in 14 chance of being the victim of a violent crime in Lake City, compared to 1 in 37 in Florida as a whole. Similarly, property crime rates soar in Lake City, where they are higher than national and state averages. The Lake City area is home to world-class medical facilities, including the Lake City Medical Center, in the event of medical emergencies or illness. Seniors in Lake City can access the Find a Ride Florida program, which connects in-need seniors with safe transportation options. Lake City has an array of community resources for seniors, including Columbia County Senior Services, an organization that offers recreational opportunities, support groups and transportation for seniors, as well as one senior center. Assisted Living costs in Lake City start around $0 per month on average, while the nationwide average cost of assisted living is $4,000 per month, according to the latest figures from Genworth’s Cost of Care Survey. It’s important to note that assisted living rates in Lake City and the surrounding suburbs can vary widely based on factors such as location, the level of care needed, apartment size and the types of amenities offered at each community. Eligible seniors in Lake City can secure funding for assisted living facility expenses through two state programs. First, the need-based Optional State Supplementation program provides a monthly stipend to income-eligible seniors. Second, the Statewide Medicaid Managed Care Long-Term Care Program is a two-pronged program that includes the Long-Term Care Managed Care Program and Managed Medical Assistance Program. Both of these programs are available to Medicaid-eligible seniors who qualify. Lake City and the surrounding area are home to numerous government agencies and non-profit organizations offering help for seniors searching for or currently residing in an assisted living community. These organizations can also provide assistance in a number of other eldercare services such as geriatric care management, elder law advice, estate planning, finding home care and health and wellness programs. To see a list of free assisted living resources in Lake City, please visit our Assisted Living in Florida page. Lake City-area assisted living communities must adhere to the comprehensive set of state laws and regulations that all assisted living communities in Florida are required to follow. Visit our Assisted Living in Florida page for more information about these laws.